Featuring the cute elephant holding balloons with the wording 'Advice for Parents'. This fabric advice book is both a lovely gift for the parents to be or a great addition to a baby shower celebration. This fabric advice book is both a lovely gift for the parents to be or a great addition to a baby shower celebration. The book consists of 32 blank pages to fill with pieces of advice and notes for the new parents to be! The book is 18cm x 18cm x 1.5cm in depth. 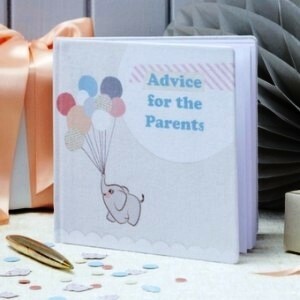 Featuring the cute elephant holding balloons with the wording 'Advice for Parents'.